Great old 61 but it was in pretty tough shape. The buyer was aware of the flaws and the price reflected them. Happy buyer. Happy seller. Ain’t life grand? I am not a ranter by nature. This doesn’t quite qualify as a rant either but I’m getting dangerously close. I’m older than any ES-335 out there and I’ve had my share of bumps and bruises over the decades. That, folks, is going to be true of any musical instrument that is fifty or more years old. Of the 400 or so ES models I’ve sold over the past few years, I think there is only one or two that could truly be called “no issue” guitars. Surviving fifty plus years completely unscathed is completely against the odds. I bought a 62 ES-335 that had been in a closet-untouched for 47 years. The finish was checked because the closet wasn’t heated and the neck needed a lot of work to undo 47 years of gravity (the guitar was on its back on the floor). I’ve also bought guitars that were played every day for fifty years that had fewer issues than the one that sat in its case. 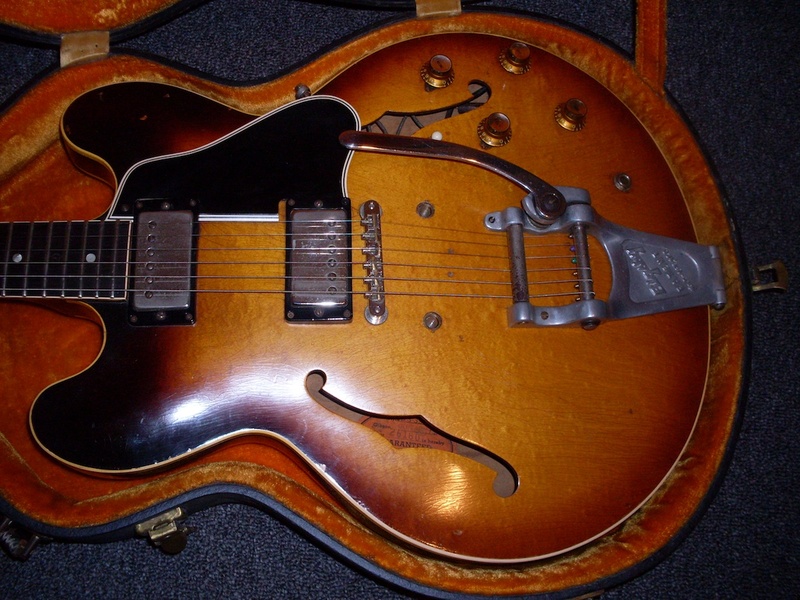 Fortunately, most vintage buyers understand that the guitar they are spending so much of their hard earned money on has been around for awhile and the forces of nature, along with the forces of guitar players (and their whims) can wreak havoc on them. But there’s big havoc and little havoc. I had a 59 with a touched up cigarette burn on the back of the headstock that I felt was a non issue. The buyer disagreed. End of sale. Funny, but on a Stratocaster or an amp, that’s almost a badge of honor. Of course, a guitar with issues is going to be less money than a guitar without issues. But the expectation that a $30000+ fifty five year old guitar is going to be perfect is a bit naive. I have never used the term “dead mint” when describing a guitar more than ten years old. There may be a few out there but i’ve never had one. 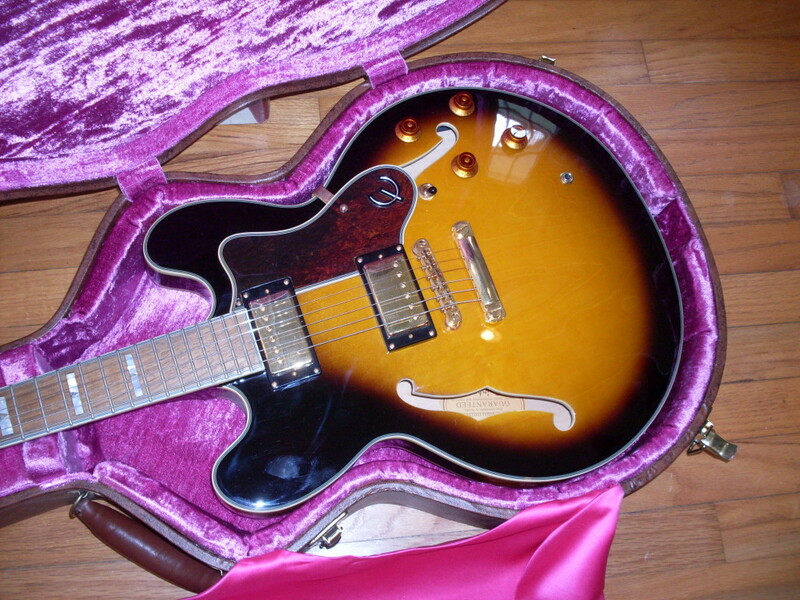 I had a 60 ES-345 that was truly a no issue guitar but it had a little ding in the headstock. Is a ding an issue? Well, if I call it “dead mint” it sure as hell is. I can’t control the other sellers (the individuals are much worse than the dealers in this regard) who use the term “mint”: so loosely. I can only try to describe my guitars as accurately as possible. That means long, boring descriptions but it also means no guitars coming back because the buyer saw something that I may have thought to be typical wear and tear. I recently sold a 59 ES-335 to a buyer who asked for the most complete description I could give him and I think that was sensible. I counted every ding and described every possible element that may have caused the buyer to question the condition. This can be taken to the extreme but I think it’s in the best interest of the buyer to do just that. “The pull ribbon inside the case is wrinkled and frayed.” Too much information? Maybe, but I had a buyer ask for compensation because the spring on a case latch was broken. But that’s an old ploy. Find something undisclosed, no matter how trivial and turn it into a reason for a partial refund. 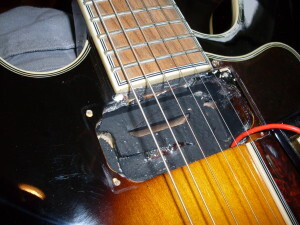 How much does a broken spring latch diminish the value of a guitar? Beats me but it can’t be much. “Knock off a hundred bucks” was the request. “Send the guitar back” was the response. Sure, if you find an incorrect part, you are entitled to the right one or a partial refund. I try not miss stuff like that. The whole point is that there can be 100 different little issues and I can mention them all in a listing but you probably won’t read it. That’s what the condition scale is for. If I call a guitar a “9”, then it’s going to have a few dings and maybe a scratch or two. Maybe even a cigarette burn. If it’s an “8”, then there will be player wear and perhaps a veneer crack in the top (although I would probably mention that). Most buyers are really happy with their purchases. My goal is to make everybody happy. If that means a little extra reading on your part, then so be it. On another subject, OK Guitars will open it’s brick and mortar shop tomorrow June 27th in Kent CT (the motorcycle capital of New England). It’s a 11 Railroad Street in “the caboose”. I’m open Friday through Sunday. Other days, if I’m there (and I probably will be but call if you’re coming a long way), then I’m open. OK Guitars opens in Kent CT June 27th. Cool guitars, cool spot. C’mon by and play. For $500 and change, this looks pretty good. OK, the sunburst is way off but whaddya want for $500? Noel Coward (yes, that Noel Coward) once said: “I’ll go through life either first class to third but never in second.” There’s a certain wisdom to that and I have adhered to the notion for a very long time. when I travel, I either stay in the best hotel in town or I stay somewhere really cheap. Dinner? Four stars or the local diner. There is a logic that is inherent to the concept. If you get the best and pay the price for it, you know you are getting the best. You are also, generally getting what you pay for. Whether it’s the best service, the best food, the best guitar or the best car. By going third class, you also know that you are getting what you pay for. Bottom dollar equals bottom quality but at least you know what you are paying for and hopefully it isn’t much. Second class is trouble because it’s trying to be first class but it fails. It costs more than third class and often turns out to be just as bad. Second class is never first class. That’s why they call it second class. Of course, I’m going to apply this logic to ES-335s and the like ‘cuz that’s what I do. A first class 335 is pretty easy to quantify. It’s not just a 59 dot neck either. A 65 is a first class guitar too, especially an early one. So’s a good 68. So, what’s a second class 335? There are plenty of them and, unless I want to make a ton of enemies, I’m not going to list the ones I think are second class. There are a lot of them. But third class…third class gets real interesting. There are plenty of players who really want a 335 and I can’t blame them. One of the reasons I’m so fond of them is because when I was a kid, I couldn’t afford one. All through high school, I wanted one but they were way out of reach (they cost almost double what a Strat cost back then). In the 70’s, I was in college and played mostly acoustic and didn’t like the new ones anyway. By the 80’s, I could afford to buy one but wasn’t playing much so I didn’t. There were no cheaper alternatives back then. As far as I know, nobody made a cheaper version of a 335 until the Japanese manufacturers started to copy the American makers. Now, there are some first class Japanese guitars out there-I’ve played Japanese Strats and Teles and Orvilles and even the Clapton 335 supposedly had the bodies shipped here from Japan (no wonder they got it right). So, where’s my third class 335? Not the neatest joinery I’ve ever seen but there is a neck tenon in there and everything is pretty solid. 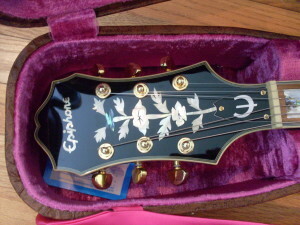 Recently, I picked up a Chinese made Epiphone Sheraton. Cost around $500 brand new without the case. 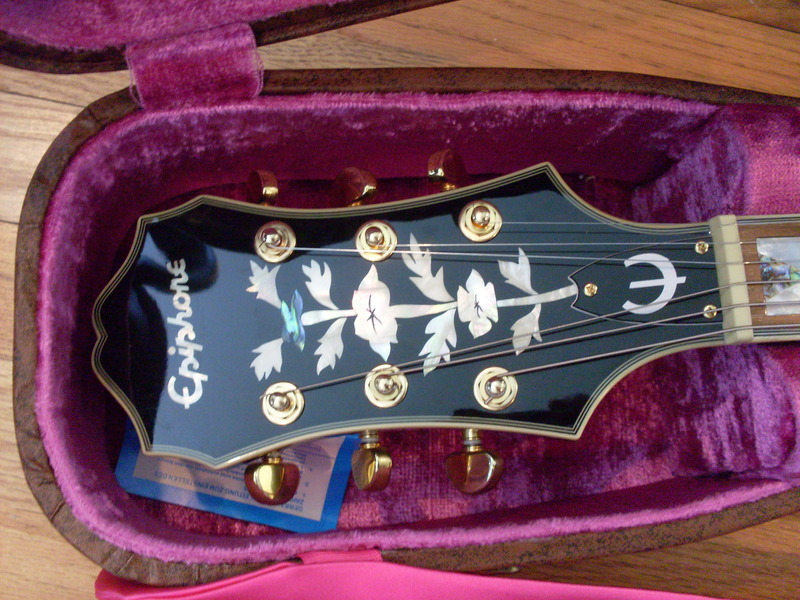 Don’t get me started on selling guitars without the case included-it gets ugly. Let’s take a closer look. Fit and finish looks pretty good, overall. The sunburst is a little funky but it’s well executed. No runs, drips or errors. The bindings are tight and properly scraped. taking a look inside, you start to see where the corners are cut, however. There’s no kerfing between the top and sides or the back and sides. There’s also no glue showing anywhere. I’m not sure how strong a bond there is without the kerfing but it seems pretty solid. Let’s look in the neck pickup rout and see if there’s a tenon in there. Good news. There is what most would call a “transitional” tenon. That’s not quite as long as a long tenon like you would see from 58-early 69 but not as small as a 69-81. It’s pretty solid though and while the work in there is a little sloppy, the work in the mid to late 60’s can be pretty sloppy too. The fingerboard wood looks kind of cheap but the functionality is there. The fret work is pretty good too. I don’t like the fret ends over the binding but that’s mostly a matter of taste. The ends are well finished. I’m pretty impressed with the inlays. Maybe the Chinese have a special skill in that area because it’s really clean looking and a Sheraton has some pretty fancy inlay in the headstock. It’s probably plastic but there appears to be some abalone in there too-just like my 59 Sheraton. Well, sort of like. Let’s plug this bad boy in and see what it sounds like. OK, through my little ’54 Supro which is about as clean as Pigpen, it sounds pretty decent. I put it up nest to a 2003 LP R9 I have here and it holds up pretty well. The Epi isn’t as fat sounding as the LP but a couple hundred bucks for a set of Seymour Duncan’s or similar will take care of that. Intonation was as good as most modern Gibsons. Sustain was just OK. Where I think the Epi falls down is that it isn’t terribly articulate or complex. Again, the electronics may have something to do with that but also, the guitar sounds more like a solid body than a semi. Unplugged, it is really quiet with almost no acoustic resonance at all. That could be a function of the construction or the wood or even the newness but the guitar doesn’t sound as much like a 335 as it does a solid like a LP. Not a bad thing unless you really want that kind of woody, airy 335 thing. Then maybe its time for an upgrade to first class. This inlay is so neat I think it might be done by a computer or a laser or something. Is that real MOP and abalone? Beats me. 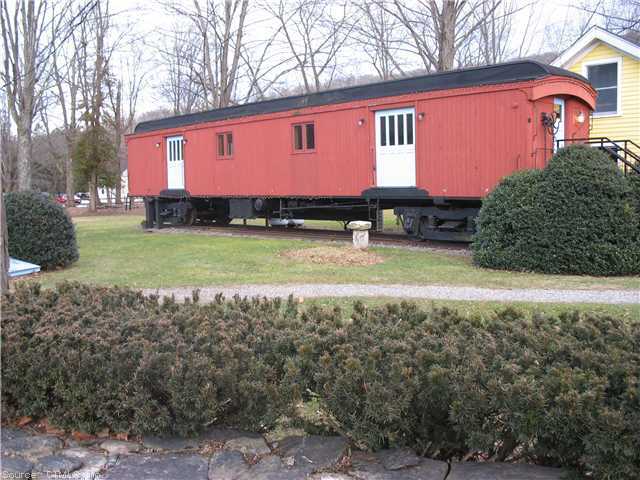 This will be the new home of OK Guitars-at “The Caboose” in Kent, CT. I will be open weekends starting June 15th and during the week by appointment for now. Everybody said “don’t do it.” Everybody said “you’ll be sorry.” Everybody said “you’ll have no life.” Everybody is probably right. So I went ahead and did it anyway. As of around June 15th, there will be an actual OK Guitars shop that you can come to and play all of the great guitars that you see on my site. 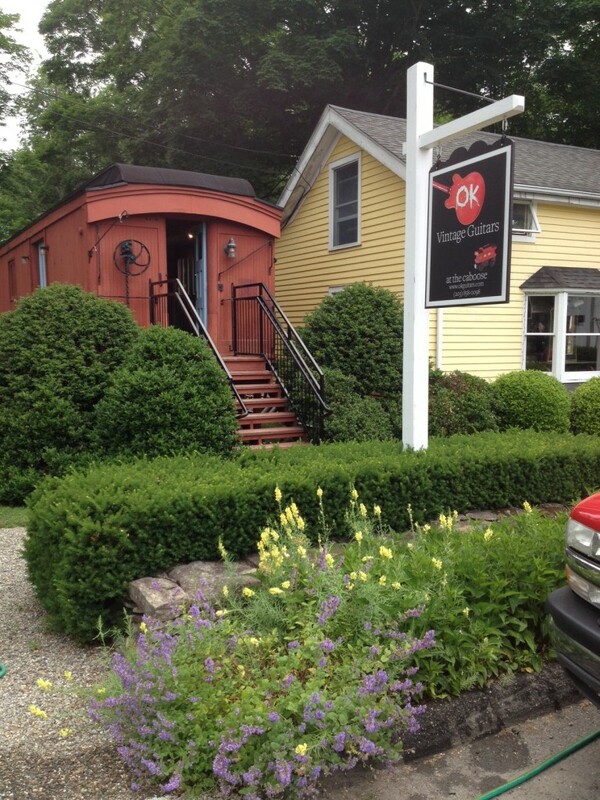 The location of OK Guitars is 11 Railroad Street in Kent, CT better known as “The Caboose.” Yep. OK Guitars is in a caboose. On a railroad track. When you think about it, how many types of businesses could actually work in a railroad car? Fortunately, guitars are pretty thin so a narrow space works just fine. The shop will be open on weekends for the Summer – Friday/Saturday/Sunday and by appointment any other time so if you happen to be driving up Rt 7 in Western CT and you want to come by, just give a call or drive the 50 yards or so off the main road and see if I’m there. If I’m there, I’m open. I’ll post my hours on the site once I figure them out. I’ll be keeping it small and still concentrating on the ES models from the Golden Era but I’ll be expanding a bit into other guitars from the 50’s and 60’s. A Strat here, a Tele there, maybe a Rickenbacker or a Mosrite might show up. That’s nothing new, really-I’ve had a few of each most of the time. The internet business will continue unchanged, of course. One of the reasons for taking this unlikely step is that it’s very hard to buy a guitar without playing it first. If you’re anywhere near New York, it’s a real nice day trip out into the country. If you’re driving, figure on 90 minutes to two hours depending on traffic. There is a train (Wingdale Station on the Harlem Line) that’ll get you close-then a 15 minute cab ride. Granted, I don’t expect my California or European clients to make a 3000 mile trip every time they are interested in a guitar but I think if you’re going to spend some serious money on a dot neck, you might be wise to make the trip and try a few. And besides, it’ll be fun. The Litchfield Hills (where Kent is) is a beautiful place. The Housatonic River runs through it as does the Appalachian Trail. There’s kayaking and hiking and Kent Falls and lots of guys on motorcycles. I’m looking at it as a grand adventure. So, c’mon down to “The Caboose” in beautiful Kent, CT. Play a few guitars, make some music, find out that I write better than I play-you know, fun stuff. Then go out for a hike. You could use the exercise and the fresh air will do you good. Just like your Mom always told you. 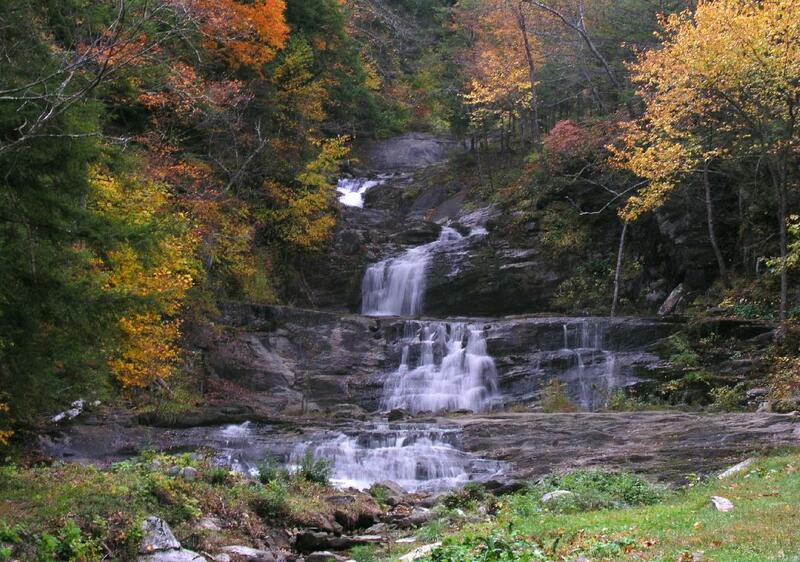 Kent Falls is right up the road.